are beautiful growing in the field with their yellow faces turned toward the sun in all their glory; however sunflowers have many uses that go far beyond their natural beauty and decorative uses. In fact, sunflowers are frequently used in foods, oils, cooking, and the like, making sunflowers very important. The following information will enlighten you on the role sunflowers hold that is above and beyond their use for sunflower pictures and paintings. 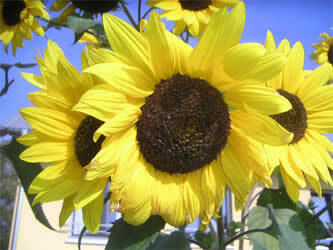 If you are interested in growing sunflowers go to the garden guide section. Sunflower seeds are very popular with baseball players; however that is not where the popularity for this seed ends! Sunflower seeds are frequently used in cooking, as salad toppers, in granola mixes, and many other culinary uses. The sunflowers grown for sunflower seeds are called either non-oil sunflowers or confection sunflowers. This simply means these sunflowers produce sunflower seeds and are not grown for their oil. Sunflower seeds are incredibly healthy and high energy foods that are enjoyed by all Americans in a wide variety of foods. Amazingly, sunflower seeds have been around forever and were even a favorite food of the Native Americans. Today, sunflower seeds come from sunflowers that are mostly grown in the Midwest in places like Minnesota and North Dakota. There are many beautiful rugs made nowadays from floweres. Surely on of the most beautiful must be the sunflower rug, these come in many shapes and sizes be sure to get yourself a sunflower rug. You may have heard of sunflower seeds as well as sunflower kernels and were wondering if there was a difference. Really, there is no difference and sunflower seeds are considered kernels when the shell has been removed by the manufacturer and just the seed is left. In the shell sunflowers are seeds that have not been removed from the shell and it is up to the consumer to do so with their teeth or however they see fit. There are three options for the sunflower seeds that are in the shell. They may be used for in shell consumption by humans, shelled for their seeds, or sent to the market for bird food. The biggest sunflower shells are used for the human market, the medium sized are shelled for their seeds for food ingredients and snacks, while the small ones are used for the birds. offer a huge health boost for individuals trying to get their daily vitamin E requirement. Amazingly, one serving of oil roasted sunflower seeds provides an individual with up to 76% of the daily requirement. In addition to this sunflower seeds provide healthy fats, protein, fiber, and plenty of other healthy benefits to individuals who eat them. Doctors recommend individuals increase their fiber intake through whole grains, nuts, and seeds and sunflower seeds is truly a great way to meet this recommendation while enjoying the amazing taste of sunflower seeds at the same time.